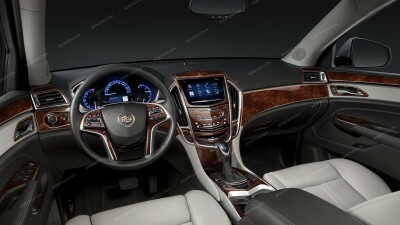 To create a unique look of your Cadillac, purchase interior dash kits from Wowtrim. They are made considering all the quality requirements of owners. Our numerous Cadillac wood grain, real wood, camouflage, aluminum & carbon fiber dash trim kits will help pick the pattern for an outstanding interior design of your vehicle. Cadillac ATS Sedan 2013, 2014, 2015, 2017, For Models With 8-Inch Touch Screen, Over OEM Trim, Full Interior Kit, 53 Pcs. Cadillac ATS Sedan 2013, 2014, 2015, 2017, For Models With 8-Inch Touch Screen, Basic Interior Kit, 37 Pcs. Cadillac ATS 2013, 2014, 2015, 2017, Exterior Kit, Full Kit (Sedan Only), 8 Pcs. Cadillac ATS Sedan 2013, 2014, 2015, 2017, Stainless Steel Pillar Posts, 6 Pcs. Cadillac ATS 2013, 2014, 2015, 2017, Basic Exterior Kit (Sedan Only), 6 Pcs. Cadillac ATS 2013, 2014, 2015, 2017, Exterior Kit, Optional Fuel Door (Sedan Only), 1 Pcs. Cadillac CTS 2004-2005, Full Interior Kit, Manual, With Logos, Without Navigation System, With Door Panels, 55 Pcs. Cadillac CTS 2003, Full Interior Kit, Manual, Without Navigation System, With Door Panels, 55 Pcs. Cadillac CTS 2004-2005, Full Interior Kit, Automatic, With Logos, Without Navigation System, With Door Panels, 55 Pcs. Cadillac CTS 2003, Full Interior Kit, Automatic, Without Navigation System, With Door Panels, 52 Pcs. Cadillac CTS 2004-2005, Full Interior Kit, Automatic, With Navigation System, With Door Panels, 47 Pcs. Cadillac CTS 2003, Full Interior Kit, Manual, With Logos, Without Navigation System, With Door Panels, 55 Pcs. Cadillac CTS/V-CTS 2004-2005, Full Interior Kit, With Door Panels, 47 Pcs. Cadillac CTS 2003, Full Interior Kit, Automatic, With Logos, Without Navigation System, With Door Panels, 55 Pcs. Cadillac CTS 2004-2005, Full Interior Kit, Automatic, With Logos, With Navigation System, With Door Panels, 47 Pcs. Cadillac CTS 2003, Full Interior Kit, Automatic, With Navigation System, With Door Panels, 47 Pcs. Cadillac CTS 2004-2005, Full Interior Kit, Manual, Without Navigation System, Without Door Panels, 55 Pcs. Cadillac CTS 2004-2005, Full Interior Kit, Automatic, Without Navigation System, With Door Panels, 55 Pcs. Cadillac CTS/V-CTS 2004-2005, Full Interior Kit, With Logos, With Door Panels, 47 Pcs. Cadillac CTS 2003, Full Interior Kit, Automatic, With Logos, With Navigation System, With Door Panels, 47 Pcs. Cadillac CTS 2004-2005, Full Interior Kit, Automatic, With Logos, With Navigation System, Without Door Panels, 43 Pcs. Cadillac CTS 2003, Full Interior Kit, Automatic, With Navigation System, Without Door Panels, 43 Pcs. Cadillac CTS 2004-2005, Full Interior Kit, Manual, Without Navigation System, Without Door Panels, 51 Pcs. Cadillac CTS 2004-2005, Full Interior Kit, Automatic, Without Navigation System, Without Door Panels, 51 Pcs. Cadillac CTS/V-CTS 2004-2005, Full Interior Kit, W/o Door Panels, 43 Pcs. Cadillac CTS 2003, Full Interior Kit, Automatic, With Logos, With Navigation System, Without Door Panels, 43 Pcs. Cadillac CTS 2004-2005, Full Interior Kit, Manual, With Logos, Without Navigation System, Without Door Panels, 51 Pcs. Cadillac CTS 2003, Full Interior Kit, Manual, Without Navigation System, Without Door Panels, 51 Pcs. Cadillac CTS 2004-2005, Full Interior Kit, Automatic, With Logos, Without Navigation System, Without Door Panels, 51 Pcs. Cadillac CTS 2003, Full Interior Kit, Automatic, Without Navigation System, Without Door Panels, 51 Pcs. Cadillac CTS 2004-2005, Full Interior Kit, Automatic, With Navigation System, Without Door Panels, 43 Pcs. Cadillac CTS/V-CTS 2004-2005, Full Interior Kit, With Logos, W/o Door Panels, 43 Pcs. Cadillac CTS 2003, Full Interior Kit, Manual, With Logos, Without Navigation System, Without Door Panels, 51 Pcs. Cadillac CTS Sedan/Wagon 2008, 2009, 2010, 2011, 2012, 2013, For Models With Automatic Transmission, Full Interior Kit, 51 Pcs. Cadillac CTS 2003, Full Interior Kit, Automatic, With Logos, Without Navigation System, Without Door Panels, 51 Pcs. Cadillac CTS 2006-2007, Full Interior Kit, With Automatic Transmission, With Navigation System, With Logo, 41 Pcs. Cadillac CTS 2006-2007, Full Interior Kit, With Automatic Transmission, With Navigation System, 41 Pcs. Cadillac CTS 2006-2007, Full Interior Kit, With Automatic Transmission, W/o Navigation System, With Logo, 49 Pcs. Cadillac CTS 2006-2007, Full Interior Kit, With Automatic Transmission, W/o Navigation System, 49 Pcs. Cadillac CTS 2014, 2015, 2016, 2017, Full Interior Kit (Sedan Only), 44 Pcs. Cadillac CTS 2006-2007, Interior Kit, Optional Door Panels With Logo, 4 Pcs. Cadillac CTS 2006-2007, Interior Kit, Optional Door Panels W/o Logo, 4 Pcs. Cadillac CTS 2014, 2015, 2016, 2017, Basic Interior Kit (Sedan Only), 37 Pcs. Cadillac CTS 2004-2005, Basic Interior Kit, Automatic, With Navigation System, 22 Pcs. Cadillac CTS 2003, Basic Interior Kit, Manual, Without Navigation System, 30 Pcs. Cadillac CTS 2003, Basic Interior Kit, Automatic, Without Navigation System, 30 Pcs. Cadillac CTS 2006-2007, Basic Interior Kit, With Automatic Transmission, With Navigation System, 22 Pcs. Cadillac CTS 2004-2005, Basic Interior Kit, Manual, Without Navigation System, 30 Pcs. Cadillac CTS 2004-2005, Basic Interior Kit, Automatic, Without Navigation System, 30 Pcs. Cadillac CTS 2003, Basic Interior Kit, Automatic, With Navigation System, 22 Pcs. Cadillac CTS/ V-CTS 2004-2005, Basic Interior Kit, 22 Pcs. Cadillac CTS 2006-2007, Basic Interior Kit, With Automatic Transmission, W/o Navigation System, 30 Pcs. Cadillac CTS Sedan/Wagon 2008, 2009, 2010, 2011, 2012, 2013, For Models With Automatic Transmission, Basic Interior Kit, 28 Pcs. Cadillac CTS 2008, 2009, 2010, 2011, 2012, 2013, Exterior Kit, Full Kit (Sedan Only), 17 Pcs. Cadillac CTS 2014, 2015, 2016, 2017, Exterior Kit (Sedan Only), 8 Pcs. Cadillac CTS Sedan 2008, 2009, 2010, 2011, 2012, 2013, Stainless Steel Pillar Posts, 6 Pcs. Cadillac CTS Sedan 2014, 2015, 2016, 2017, Stainless Steel Pillar Posts, 6 Pcs. Cadillac CTS 2003, 2004, 2005, 2006, 2007, Stainless Steel Pillar Posts, 6 Pcs. Cadillac CTS 2008, 2009, 2010, 2011, 2012, 2013, Basic Exterior Kit (Sedan Only), 6 Pcs. Cadillac CTS 2003, 2004, 2005, 2006, 2007, Stainless Steel Pillar Posts, 4 Pcs. Cadillac CTS 2008, 2009, 2010, 2011, 2012, 2013, Optional Door Storage Interior Kit (Sedan/Wagon Only), 4 Pcs. Cadillac CTS 2008, 2009, 2010, 2011, 2012, 2013, Optional Overhead Console Interior Kit (Sedan/Wagon Only), 8 Pcs. Cadillac CTS 2003, 2004, 2005, 2006, 2007, Exterior Kit, 6 Pcs. Cadillac CTS 2014, 2015, 2016, 2017 Exterior Kit, Optional Fuel Door (Sedan Only), 1 Pcs. Cadillac CTS 2014, 2015, 2016, 2017, Optional Front Overhead Console Interior Kit (Sedan Only), 3 Pcs. Cadillac CTS/V-CTS 2004-2005, Interior Kit, Optional Door and Console "V" Logo Insert, 5 Pcs. Cadillac CTS 2004-2005, Interior Kit, Optional Door and Console "CTS" Logo Insert, 15 Pcs. Cadillac CTS 2006-2007, Interior Kit, Optional Door Panel "CTS" Logo Insert, 12 Pcs. Cadillac CTS 2004, 2005, 2006, 2007, Interior Kit, Optional Console "CTS" Logo Insert, 3 Pcs. Cadillac CTS/V-CTS 2004-2005, Interior Kit, Optional Console "V" Logo Insert, 1 Pcs. Cadillac CTSV-CTS 2004-2005, Interior Dash Kit, Optional Steering Wheel "V" Logo Insert, 1 Pcs. Cadillac Deville 1994, 1995, 1996, Interior Kit, For Models With Radio, 14 Pcs. Cadillac Deville 1994, 1995, 1996, Interior Kit, For Models Without Radio, 13 Pcs. Cadillac Deville 2000, 2001, 2002, 2003, 2004, 2005, Stainless Steel Pillar Posts, 6 Pcs. Cadillac Deville 2000, 2001, 2002, 2003, 2004, 2005, Exterior Kit, 6 Pcs. Cadillac DTS 2006, 2007, 2008, 2009, 2010, 2011, Stainless Steel Pillar Posts, 6 Pcs. Cadillac DTS 2006, 2007, 2008, 2009, 2010, 2011, Stainless Steel Pillar Posts, 4 Pcs. Cadillac DTS 2006, 2007, 2008, 2009, 2010, 2011, Exterior Kit, 6 Pcs. Cadillac Escalade 2007, 2008, 2009, 2010, 2011, 2012, 2013, 2014, Exterior Kit, Full Interior Kit, 23 Pcs. Cadillac Escalade 2007, 2008, 2009, 2010, 2011, 2012, 2013, 2014, Basic Exterior Kit, 4 Pcs. Cadillac Escalade/Escalade EXT 2003, 2004, 2005, 2006, Interior Kit, Optional Overhead Without Sunroof, 1 Pcs. Cadillac Escalade 2002, 2003, 2004, 2005, 2006, Interior Kit, Optional Overhead With Sunroof, 1 Pcs. Cadillac Escalade 2003, 2004, 2005, 2006, Interior Kit, Optional Overhead With Sunroof, 1 Pcs. Cadillac Escalade 2003, 2004, 2005, 2006, Interior Kit, Optional Overhead Air Vents, 6 Pcs. Cadillac Seville 1998, 1999, 2000, 2001, 2002, 2003, 2004, Stainless Steel Pillar Posts, 6 Pcs. Cadillac Seville 1998, 1999, 2000, 2001, 2002, 2003, 2004, Exterior Kit, 6 Pcs. Cadillac STS 2005, 2006, 2007, Without Navigation System, Over Silver OEM, Full Interior Kit, 47 Pcs. Cadillac STS 2005, 2006, 2007, Without Navigation System, Over Silver OEM, Basic Interior Kit, 14 Pcs. Cadillac STS 2005, 2006, 2007, 2008, 2009, 2010, 2011, 2012, 2013, 2014, 2015, Stainless Steel Pillar Posts, 6 Pcs. Cadillac STS 2005, 2006, 2007, 2008, 2009, 2010, 2011, 2012, 2013, 2014, 2015, Exterior Kit, 6 Pcs. Cadillac STS 2005, 2006, 2007, Interior Kit, Optional Shifter Surround With Logo, 1 Pcs. Cadillac STS 2005, 2006, 2007, Interior Kit, Optional Shifter Lettering Insert, 3 Pcs. Cadillac SRX 2013, 2014, 2015, 2016, Full Interior Kit (Without OEM Wood), 55 Pcs. Cadillac SRX 2010, 2011, 2012, Full Interior Kit (Without OEM Wood), 55 Pcs. Cadillac SRX 2004, 2005, 2006, Full Interior Kit, Without Navigation System, 51 Pcs. Cadillac SRX 2007, 2008, 2009, Interior Kit, Over OEM Kit, 63 Pcs. Cadillac SRX 2004, 2005, 2006, Basic Interior Kit, Without Navigation System, 36 Pcs. Cadillac SRX 2010, 2011, 2012, Basic Interior Kit (Regular Kit Or Match OEM), 18 Pcs. Cadillac SRX 2013, 2014, 2015, 2016, Basic Interior Kit (Regular Kit Or Match OEM), 23 Pcs. Cadillac SRX 2010, 2011, 2012, 2013, 2014, 2015, 2016, Exterior Kit, 10 Pcs. Cadillac SRX 2004, 2005, 2006, 2007, 2008, 2009, Exterior Kit, Full Interior Kit, 15 Pcs. Cadillac SRX 2010, 2011, 2012, 2013, 2014, 2015, 2016, Stainless Steel Pillar Posts, 8 Pcs. Cadillac SRX 2007, 2008, 2009, Optional Overhead Console Interior Kit, 14 Pcs. Cadillac SRX 2010, 2011, 2012, 2013, 2014, 2015, 2016, Stainless Steel Pillar Posts, 4 Pcs. Cadillac SRX 2004, 2005, 2006, 2007, 2008, 2009, Stainless Steel Pillar Posts, 6 Pcs. Cadillac SRX 2004, 2005, 2006, 2007, 2008, 2009, Basic Exterior Kit, 6 Pcs. Cadillac SRX 2010, 2011, 2012, 2013, 2014, 2015, 2016, Optional Front Overhead Console Interior Kit, 2 Pcs. Cadillac SRX 2010, 2011, 2012, 2013, 2014, 2015, 2016, Optional Rear Seat Cupholder Console Interior Kit, 4 Pcs. Cadillac SRX 2007, 2008, 2009, Interior Kit, Optional 3rd Row Side Cupholders, 2 Pcs. Cadillac SRX 2007, 2008, 2009, Interior Kit, Optional Rear Center Console Without DVD Player, 2 Pcs. Cadillac SRX 2010, 2011, 2012, 2013, 2014, 2015, 2016, Exterior Kit, Optional Fuel Door, 1 Pcs. Cadillac XTS 2013, 2014, 2015, 2017, Exterior Kit, Full Interior Kit, 20 Pcs. Cadillac XTS 2013, 2014, 2015, 2017, Basic Exterior Kit, 6 Pcs. Cadillac XTS 2013, 2014, 2015, 2017, Exterior Kit, Optional Fuel Door, 1 Pcs.